When it comes to parties and holidays, I never know what to bring, but I also hate showing up empty-handed. 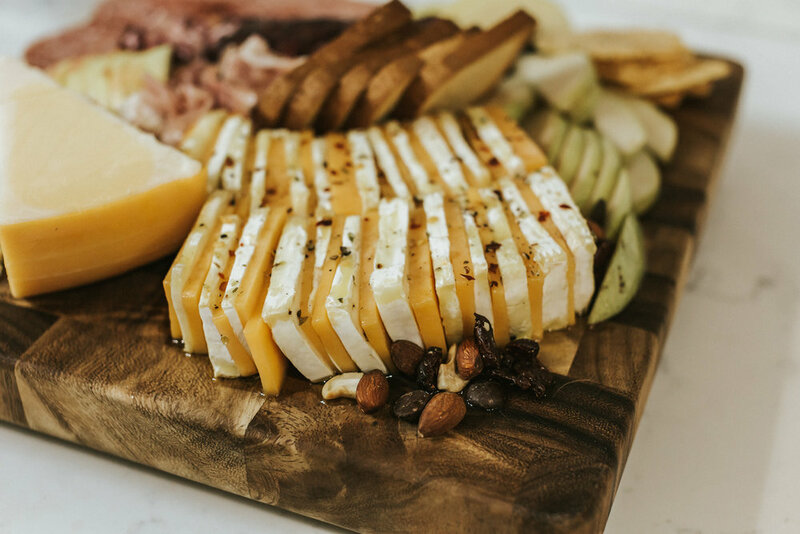 I love being creative while cooking and making things “pretty” and presentable, so the first time we hosted family at our house I somehow stumbled across the idea of a pretty marinated cheese tray. It was a hit and the whole thing was devoured during the party, and I have had so many people ask me for the recipe that I figured it was time for a blog post. This “recipe” uses things you already have (olive oil, spices and dried herbs), but I definitely recommend using fresh herbs like parsley or rosemary for the best flavor. I also recommend hitting up the cheese section at Trader Joe’s- it’s all more mainstream/popular cheeses that people actually eat. If you’re going to a more sophisticated event, try the Nugget or Whole Foods for artisanal cheeses. I started with a medium cheddar and a slicing brie because they were both about the same size/width. I slice them fairly thin and usually use the whole block of each. Once they’re sliced, get to stackin’. I find it easiest to stack them upwards like the image below before laying them down on the tray. You’ll need olive oil, salt and pepper grinders (I always prefer grinders over shakers because it tastes fresher), a lemon wedge, chili flakes and spices. I usually use sage, rosemary or parsley, but didn’t have any this time, so I used dried oregano. I like to do minimal salt, lots of pepper and chili flakes. Drizzle olive oil over the top and let it soak in. Then add more olive oil (it will pool around the bottom). If you’re making this the day before an event, you can put it in the fridge. Keep in mind the oil will solidify in the cold, so it will need to be removed and brought to room temp before serving. If I do this, I will usually let it “thaw” and then flip the block over so that the top of the cheese is now in the pool of oil. Then I add more spices/salt/pepper and drizzle a little more oil on top to refresh it. Below are other items I used to make the actual cheese board.